Growing up, I went to many schools, and I had to fit in to many different types of environments with totally different social groups. It helps me out as I move from job to job. Talking about the relationship status of Toby Stephens, he is married to New Zealand-born actress Anna-Louise Plowman. They got into a married relationship after dating for eight months. The couple married on 15 September 2001 and been blessed with three children. His first child Eli Alistair was born in May 2007, second child Tallulah was born in May 2009 and the third child was born in September 2010. He doesn’t have any extramarital affairs and there isn’t any rumor on their separation. The couple is living a happy married life together with their children. 1 Who is Toby Stephens? 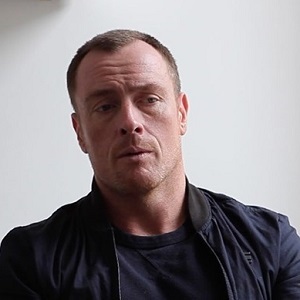 Toby Stephens is an English actor in both television series and movies as well as a stage actor. He is mostly known for his work as Gustav Graves in James Bond film ‘Die Another Day’, as Captain William Gordon in ‘Mangal Pandey: The Rising’, as Vincent McCarthy in ‘The Machine’ and as Prince John of England in ‘Robin Hood’. Talking about his early life he was born on 21 st April 1969 in Middlesex Hospital. His nationality is British and ethnicity is English. He experienced his childhood in London, England. His parents were Dame Maggie Smith(mother) and Late Robert Stephens(father) who were actors of UK. He was born as the younger child and has a brother named Chris Larkin. Stephens got his education from Aldro and Seaford College. Since childhood he was interested in the entertainment industry so he joined London Academy of Music and Dramatic Art (LAMDA). Stephens is the stepson of Patricia Quinn and became an older brother of Quinn Hawkins. Stephen and his brother grew up traveling back and forth across the Atlantic with their mother for her numerous acting engagements. Toby went to Aldro School and Seaford College. Later, he joined London Academy of Music and Dramatic Art. Toby Stephens debuted from the movie ‘Orlando’ portraying a role of Othello in 1992 where he gave a start to his career. After then he started to appear in numerous movies and television series. In 1999, he has even appeared on Broadway ‘Ring Round the Moon’. While he was doing theater, he turned down many Hollywood movies so that he could concentrate mainly on theater. In 2002, he appeared in a James Bond film ‘Die Another Day’ as Gustav Graves. His career took on a successful path after then. He was known to the world with his acting skills. Toby Stephens has even appeared in a Bollywood movie ‘Mangal Pandey: The Rising’ portraying his role as Captain William Gordon. Ian has won various awards for his acting skills. His net worth is $5 Million Dollars but his salary is unrevealed. Talking about the rumors and controversy, there’s an ongoing rumor on Toby Stephens that he’s going to appear in the remake movie of ‘Lost in Space’ in 2018 portraying his role as John Robinson. Talking about her body measurement he is 5 Feet and 11 Inches (1.8m) tall and his other body measurements are unknown. He has hair color is brown and eye color is blue. He is active on Twitter and has over 35.5k followers on his Twitter account. He does not use Facebook and Instagram.